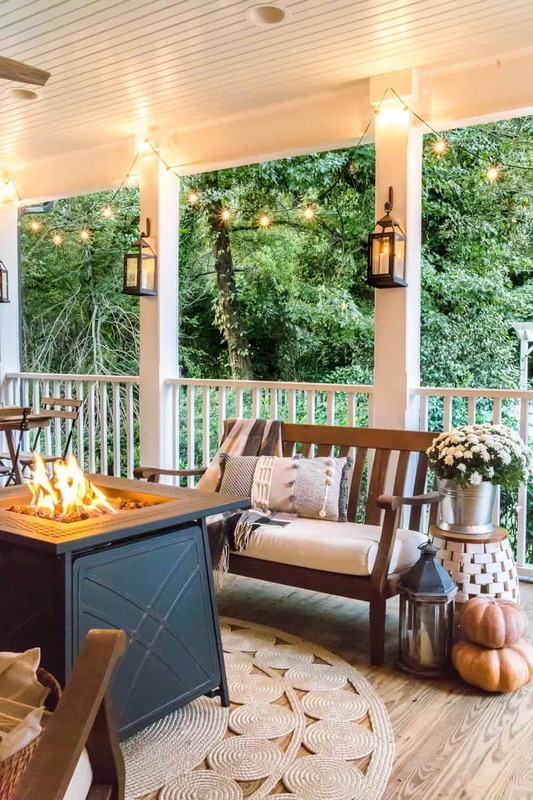 While fall is in full swing, many of us are still dreaming of summer’s warm weather and long days filled with sunshine and barbecue on the patio. 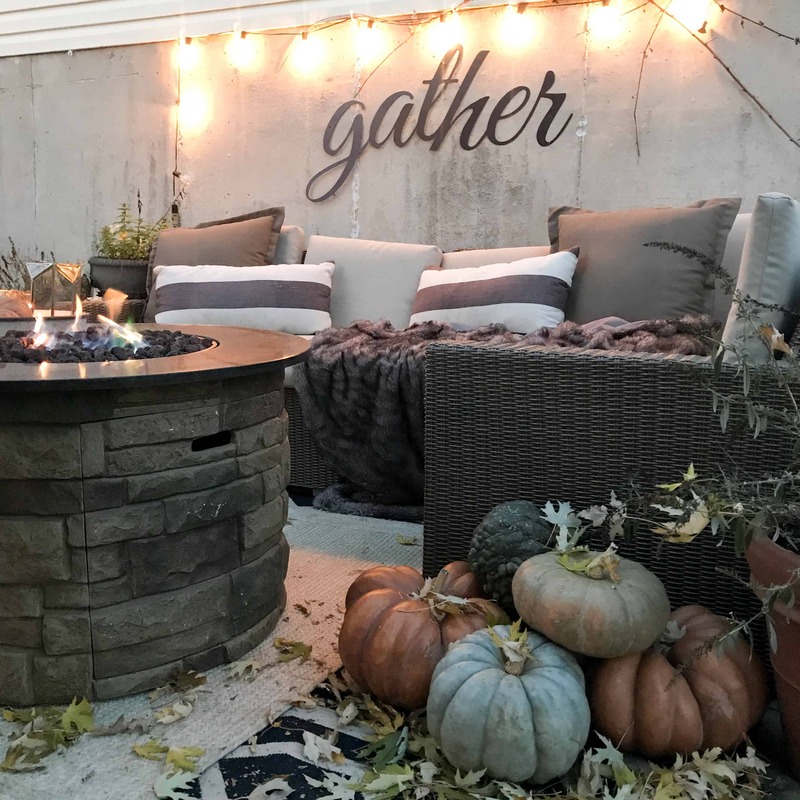 However, that is no longer the case, so it is time to decorate the patio for fall and embrace the beautiful fall colors that bring a cozy touch to any outdoor space. 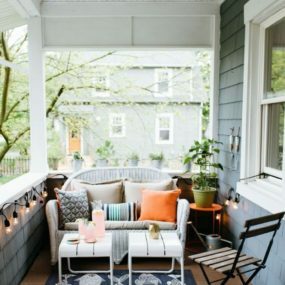 With a few easy updates, your porch could be fall ready in a matter of minutes. 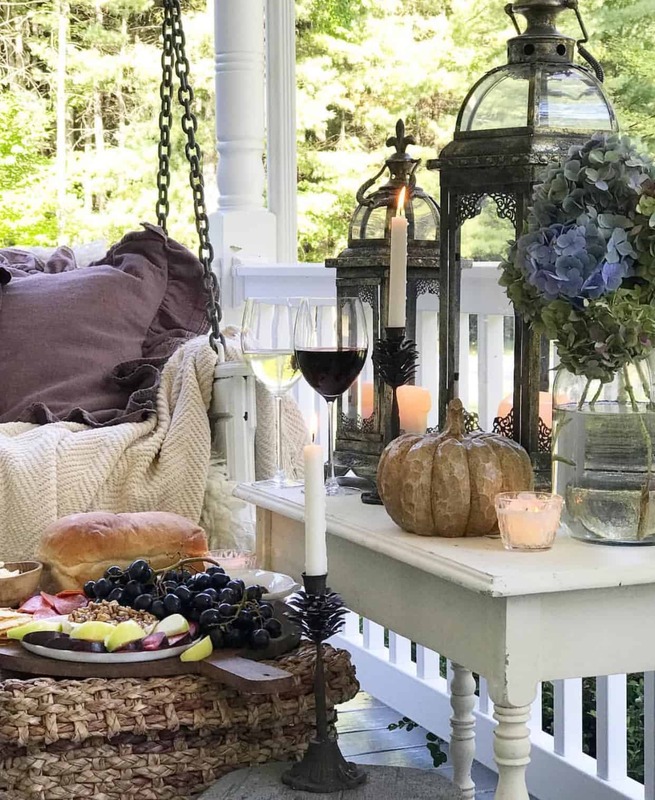 We’ve gathered some of our favorite patio décor that will take your space from summer to fall quickly and beautifully. If you’re looking for the perfect contrasting color, consider blue. Rich hues of navy will help bring a rich flair to your fall decor, pair with neutral hints that already exist in the patio for a beautiful contrast. 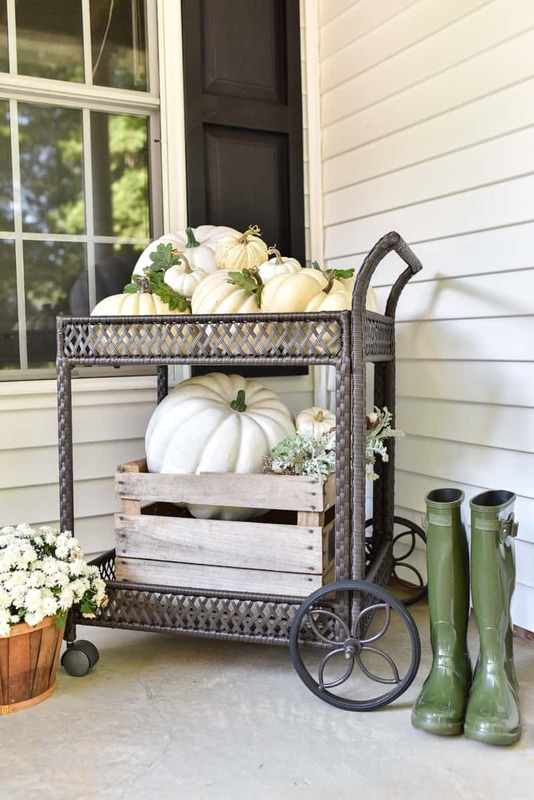 There’s no better way to bring fall classics than to display them as part of your decor. Add signature bits and have them make a bold statement without the need of going over the top. If you have an outdoor table (which you should) you want to add a decorative topper. 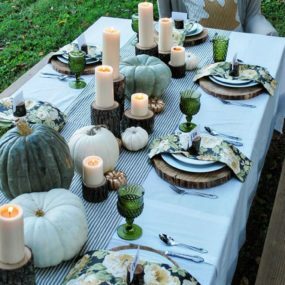 Having a blend of pumpkins, succulents, leaves and more sitting beautifully on your table will bring undeniable fall cheer. Additionally, you want to add color and texture for an added bonus. Having bold elements lends itself for a bold area that can be transformed at any given time, add natural bits to ensure your fall decor blends seamlessly. Fall lends itself for bold colors; therefore, you want to take advantage of this and go big or go home. 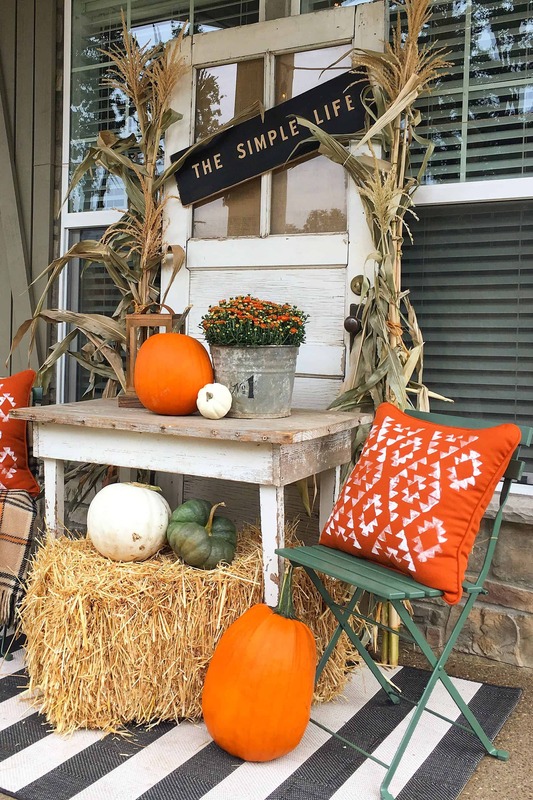 Add pops of warmer hues and coordinate it with fall essentials such apples, pumpkins, and patterned bits to bring your décor altogether without having any traces of summer only warmer bits such as red, brown or even chestnut. 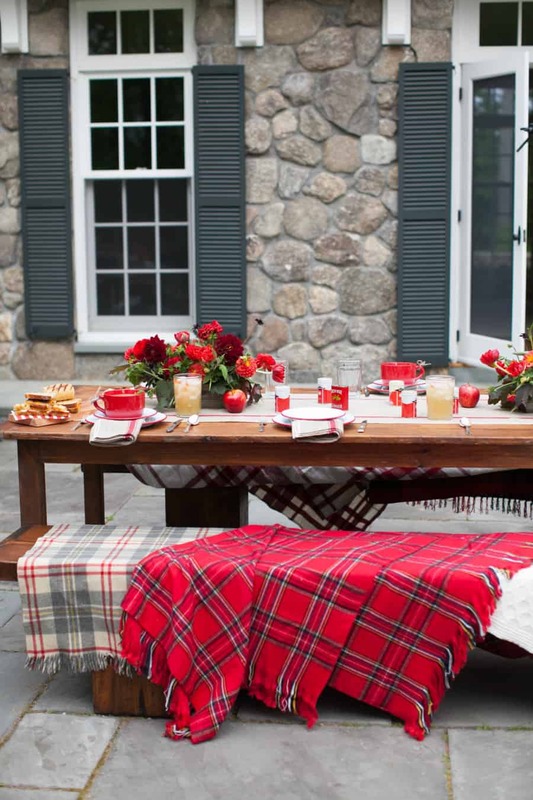 Add an elevated appeal with plaid touches that are simple and cohesive yet make the biggest impact due to their color and how they’re displayed. We could not have this guide without incorporating plaid. Plaid is an essential bit for fall, it just brings a cozy touch to anything you decorate or wear. Therefore, it only makes sense to pair it with any bits that you already have. However, not only do you want to add plaid, but you want to throw in pillows as well. Throw pillows are great especially because you can interchange them multiple times a year depending on how you prefer to decorate. 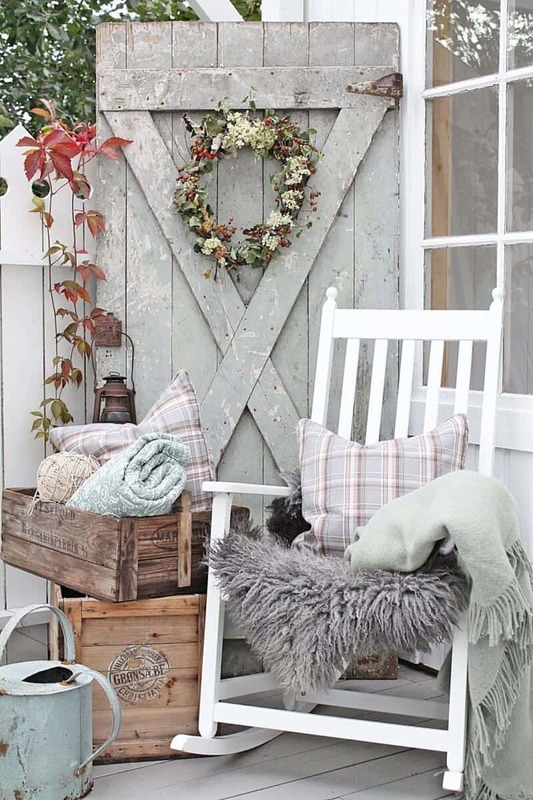 Add them into your porch seating for a cozy touch that comes to life with your plaid patterns and pillows. 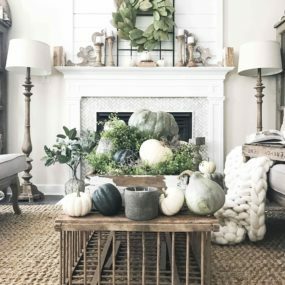 White pumpkins are perfect for those that want classic fall decor without having to use too much color or texture. The white pumpkins give you enough color and texture on their very own. While Halloween is fully over pumpkins are a favorite of the season in general, but with a twist. The twist being orange pumpkins are out and white ones are in. Think of white pumpkins as traditional pumpkins older, hotter sister. They have a touch of elegance while still being festive and fun. Add them in multiple different sizes to keep that festive appeal but in a more nontraditional beautiful kind of way. 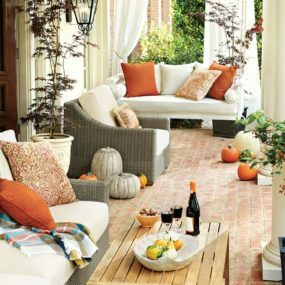 Sometimes all your patio needs is a hint of classic fall, which is why orange is the perfect hue. Pair it with green for a beautiful, fresh contrast. Most of us will want to shy away from the classic shades of orange but its still a top contender even for us. Add in bold shades of orange and pair them in with bits of green this with balance out the daring feel orange hues tend to bring. Keep it chic by having similar shades of orange that look and feel a bit more modern. 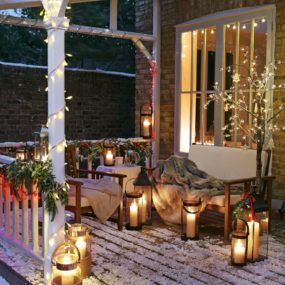 For an intimate look add lanterns, that will give the area a warming touch that shines bright even when the sun is no longer visible. 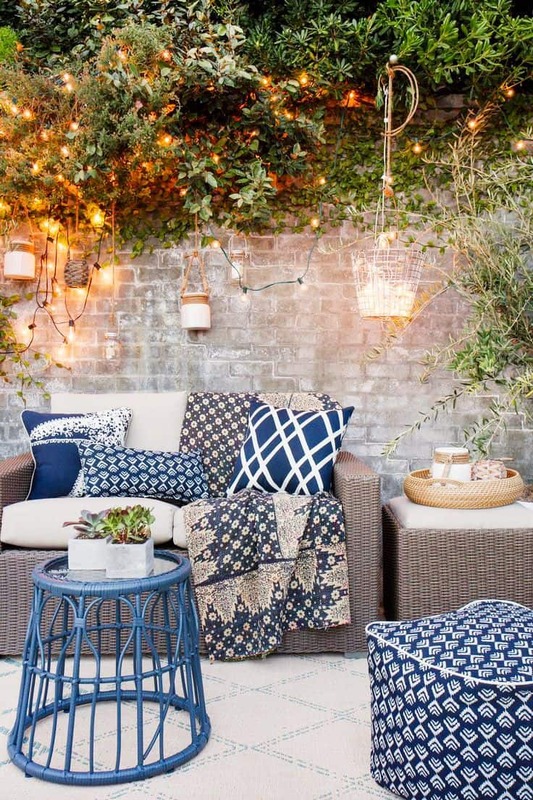 As the weather becomes cooler the sun tends to go down a whole lot earlier; therefore, bringing light back into your patio will ensure you spend a bit more time outdoors. 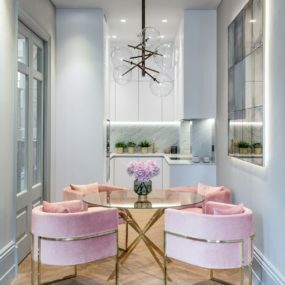 Consider candle chandeliers as an alternative to traditional lighting, not only will they bring a cozier feel, but they help warm up the room as well. You might want to pair them with string lights to have that classic patio décor approach. Don’t want to have real flames as part of your fireplace? 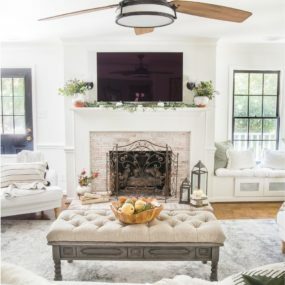 Decorate around it with classic fall decor to bring that cozy, warm feel having a fireplace brings without having to turn it on. 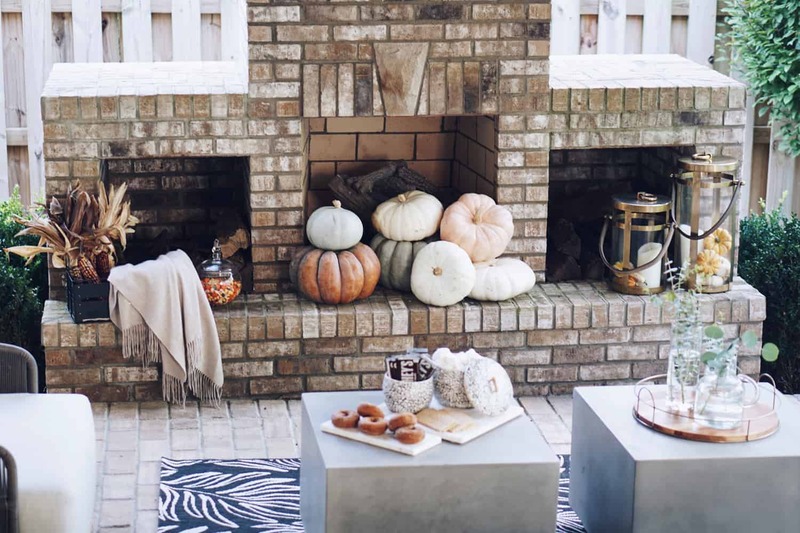 No matter how warm or chilly it might get during the fall months a fireplace is always a good idea, especially if you have a large patio area. Patios make the perfect excuse for a fireplace, whether you prefer an electric one or a traditional brick fireplace you want to have one that brings cozy to the next level. The more clear you are about your theme, the easier it will be to decorate around it. Be sure to add classic signature bits to ensure your theme is felt throughout. While we all love a collage of colors, most of us can’t handle such intensity without overthinking. Therefore, selecting and creating a well-defined color palette is the way to go. The idea is to create a theme that flows throughout your patio yet screams fall in a simplistic manner. Add hints of metallic to fully define your display without taking away from what you already have. If you aren’t fond of having an ordinary picnic table and expanding from there, consider having a bench seating and adding cushions that have an upholstered feel to them, this will create the same feel without the elements you dislike. If you don’t already have a setup outdoors with furniture and all its time to bring an upholstered touch. You might even want to consider taking an ordinary picnic table and pairing it with a beautifully upholstered seat for a touch of glamour in your patio. Your patio deserves to be a part of your décor even if it seems a bit too chilly to sit outside and enjoy the beautiful earlier sunsets. 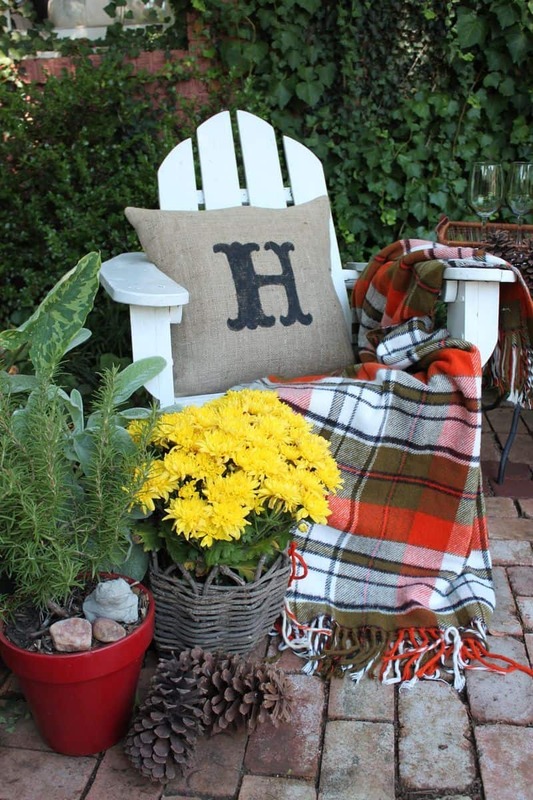 How are you bringing a fall touch to your patio space?